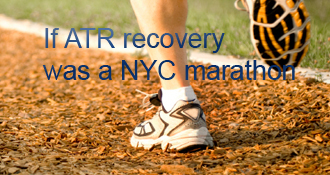 fuegalicious has completed the grueling 26.2 ATR miles to full recovery! 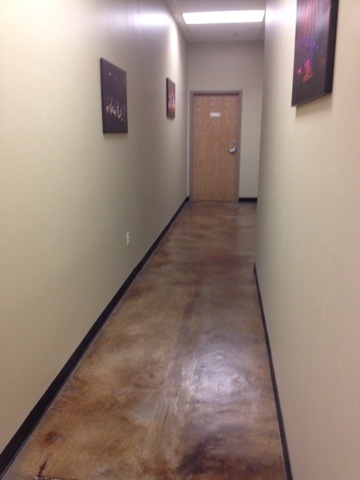 No crutches, no leaning on counters/walls/beds/handles/chairs, no hopping hobbles. Walking shuffles. Almost just a shifting of my weight side-to-side as I moved my legs forward, but honest-to-God walking. Bring it. I know it’s not condoned, but I’ve been going stir-crazy. It needed to happen. Today, I drove. It’s been a week since I got my plaster cast removed. Since then, my aircast has helped me bear more weight every day. When I asked my OS (before the surgery) if I could drive, he said no. He also said that he wouldn’t be following me home, so if I do drive, please don’t do it while on painkillers. Deal. Before surgery, I was driving in shoes with a complete tendon rupture, so I’ve got the mechanics down. Let the foot do as it will, the rest of the leg can be responsible for the shifting. I needed to be in Logan (120 miles North of where I live) for a teacher fair on Tuesday. Dilemma: I can’t drive & no one I know goes up there. Solution: public transit adventure. Every step of the way was SOMETHING. 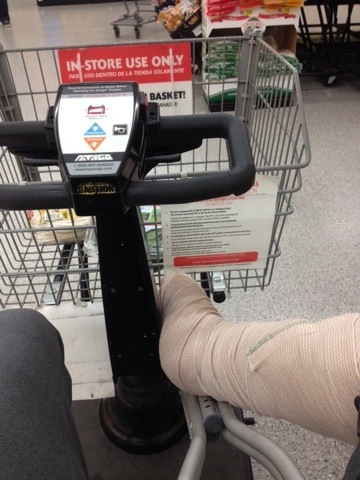 Monday, after I got my cast taken off, I went back to work. Hooray! It’s the final week of the 3rd term, so everything was pretty hectic (students waited until the last minute to turn in the homework they had been avoiding, etc), especially since I had been out for the 2 weeks prior. I worked straight through lunch & right up until my carpool needed to leave. Woo! Adrenaline rush on crutches. My carpool needed to pick up her wedding dress & she was going to drop me off at the commuter train on her way home. Her GPS navigation got really confusing near the final turns & she followed a bus into what she thought was the park ‘n’ ride. It was the “bus only” lot. Yeah, we got pulled over for that one. After the officer sent us off with a warning & directions to the commuter train lot, I found that I had missed my intended train, but the next train was one of the few that goes past Ogden (which is usually the end of the line) so I had lucked out in that respect! The train even had power outlets, so I was able to charge my phone & take care of a few things. Like purchasing my shuttle fare for the evening. I got off the train a few hours later in Pleasant View and started crutching to the bus stop; it was gusty & starting to hail. A woman offered me a ride to the bus stop (half a block away) and, though I did try to turn down her offer, accepted her kindness. When I told her my bus was only 40 minutes in coming, she suggested I come over for a quick dinner with her family! She only lived a few blocks down the road and I’d only eaten granola bars all day, so I eagerly agreed. Happy St. Patrick’s Day, we ate slow-cooked steak, potatoes, & carrots. Luck o’ the Irish? She returned me to my bus stop right as it whizzed by us, so we chased it down & I continued on my journey. As soon as I sat down, the man next to me asked what I’d done to me leg. I thought, “So we’re talking on this bus, are we? I’ll rest later.” He has bone cancer, so we bonded over our increased appreciation for simple mobility. Pleasant conversation, warm bus ride, and then back into the storm with my loaded backpack. By this point, my bladder was screaming for a break, so before I started the 1.5 mile crutch to the shuttle stop, I headed toward Wal-Mart to use the facilities & maybe just sit on a bench for a few minutes. As I was crossing the parking lot, I was offered another ride! This time, it was an elderly couple that ferried me to my next destination. We had common ties to the town in which I do my student-teaching. Utah really is a small world. After exchanging names that I’ve unfortunately forgotten, I crutched straight indoors a full 2 hours early for my shuttle. Grateful for the extra time (and for not having to crutch the full 1.5 miles), I spent it on grading papers & texting. When I finally arrived in Logan around 11pm, my friend was waiting in the parking lot for me. Sweet victory, I had arrived! We spent the next few hours preparing for the teacher fair. I think I went to bed around 3:30 & got up at 6:30. It took me a full 2 1/2 hours to get ready, not including breakfast (because I skipped it - I was out if time! ), making my morning average to be one task per 15 minutes. Tasks included: shower, dress, brush teeth, put on makeup, pack my bag, do ROM exercises, use the restroom, straighten hair, & I’m sure I did another task or two. Life takes so much longer on crutches! Between the library, the teacher fair, and several errands on campus, I crutched a few miles. Since I’m stubborn, that included many flights of stairs. My the time I got to the University Inn (my return shuttle stop), I was absolutely spent. And then my shuttle driver rolled in. Blasting country music & skimming the curb with a single tire. Out stepped the angel Frank, my driver. Boots, jeans, button-up shirt under a vest, handkerchief around his neck, and a cowboy hat. 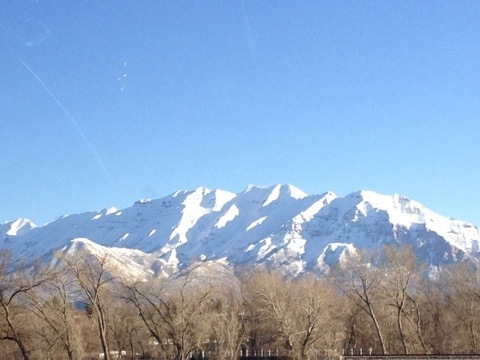 Factor in the unflappable affability & his offer to take me all the way to Salt Lake City even though I’d only paid for fare to Brigham City, and I was about ready to marry that cowboy. Or at least ask for a dance. We talked about John Wayne, Burt Reynolds, & people he knows all over Utah. I rode through heaven to the Salt Lake Central Depot. From there, I took the commuter train back south, caught a bus, and accidentally got off 1 stop too far. Rather than wait for a northbound bus in the cold, since it was around 9pm by this point (and I was getting picked up for work at 6:45 the next morning), I crutched a mile or so back toward my apartment. It was slow, painful going and I stopped several times before I decided to sit down in Starbucks and call for backup. I told my roommate I didn’t think I could walk anymore & she came straightaway. Monday & Tuesday, check. Adventure. Wednesday was hectic, but by comparison it felt tame. I did get stuck at work until 5:30 because no one could give me a ride to the bus before then. I crutched over to my friends’ apartment since it is close to a bus stop & I learned my lesson the previous night. The week was wearing on me, so I ended up staying the night there. Though I tried to recover on Thursday (and did successfully rest/elevate my leg for a good, long while), by the time I got all my work done and coached a lacrosse game, I was so tired that my simple plans for the evening (shower, dinner, bed, wake up early to prepare for Friday) seemed daunting. It’s no small wonder, then, that I was so tired I fell asleep with dinner in the oven. 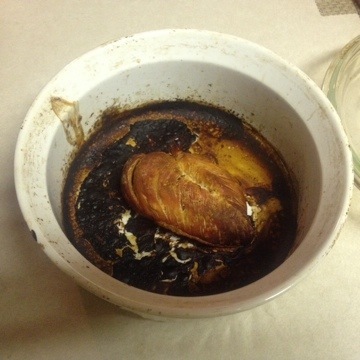 For the record, this is what a frozen chicken breast (that had taken up the entire diameter of the dish) looks like when your roommate gets home around midnight & turns off the oven because the charring smells didn’t wake you. The cast came off today! 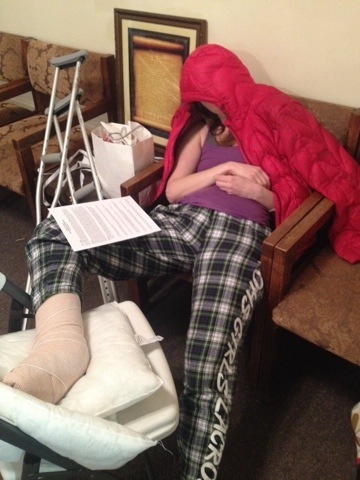 I’m in an aircast with 3 wedges (remove one a week) and PWB as much as is comfortable. Back to the OS in 4 weeks for another post-op. He’s hoping to start some actual PT shortly thereafter! My 10 ROM exercises per day are allowed to be supplemented with my choice of appropriate activity: stationary bike with the aircast, weights in the gym, and in a week I can swim. (No full immersion of the injury for a week, to ensure proper wound-healing under my steri-strips.) All in all, my OS was pleased with my progress & I was thrilled at his instructions! I went back in the aircast (I feel so LIGHT!) and was testing out how much weight I could bear. Without thinking, I took 2 or 3 hobbling steps in the aircast from the front to rear passenger door to retrieve my own crutches. The tingling pain I felt scared me so badly that I spent the rest of the morning fearing I’d reinjured my tendon! I’ve definitely undone any “ahead-of-the-curve” delusions of pushing my tendon to be strong quickly. I’m hoping I can be realistic and progress correctly. After church, we stopped for fajita fixins. This is what transpired. I would really like to be able to title this post “Gimpy, MD.” Unfortunately, that goes against my moral compass. Darned ethics. I got to watch lacrosse today! (I coach a high school girls’ team.) It’s a good thing I went, because I administered first aid twice. 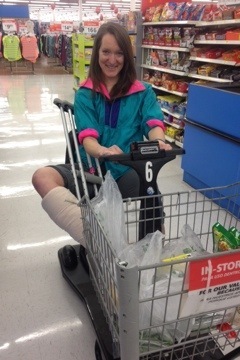 While on crutches. Like a boss. I just had a Buddy the Elf public restroom experience. It was ridiculous. And (no pressure) a blind man held the first door for me, so I ended up guiding him through the hallway, door after door, and the freaking Lincoln Tunnel to the bathrooms. Without making any wrong turns. I’ve gotten into the habit of pushing push-doors open with my shoulder so I can crutch in as it swings. This time, as I went to push the door I just kept pushing! Oops. Almost ran into the woman who had already started to open the door from the other side as I pushed into the door that had been there just a second ago! We had a good laugh and I learned to open push-doors with my knee. 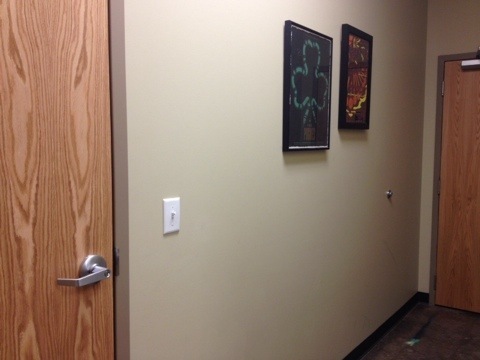 When my friends went to the bathroom after me, they ended up in a kitchen storage area, a game room (local business next door), and the restaurant one door too far on the way back. Hooray! Another jailbreak day! My roommate didn’t tell me she was leaving the apartment unattended for a week, so I went to pick up the mail. It feels so good to get out & about, if only for an hour or so. I love the view from my tower window, but variety is the spice of life & it’s nice to see the world from a different angle. The next big excitement for the day will be a nice, relaxing bath. After getting everything in place, I’m exhausted. I never really feel clean after sponge-bathing, so it’s worth it to be able to wash my hair, but I sure am earning these baths in sweat & prep-crutching! When I can finally shower, it will be gloriously loooooooow-maintenance. Just how I like it. One week ago, I was talking with the anesthetist about…I don’t even know what (we may have been joking about how I had so many signatures on my leg I was planning on framing it & sending it to the Met - on loan, of course)…and then seconds later I was waking up to someone saying, “Okay, that’s it. You’re done! You don’t believe me, do you?” I told him, of course, that I didn’t, and my recovery since then has been similar parts denial/acceptance/anxiety/tenacity. I didn’t feel like any time had passed between being knocked out & brought back to. It didn’t feel like I had been moved, intubated, flipped, sliced, stretched, sutured, stitched (I’m sure there’s a difference & that I have got it backwards, but I’ll educate myself on the particulars later), and moved to the recovery room. I didn’t even think I had left my little pre-op cubicle. I know that I’m on crutches and need to operate in ways that are strictly non-weight-bearing (NWB), but one of my biggest fears is that I will get out of a car/bed/couch right leg first and step up on that leg without thinking. Especially in the middle of the night when I my auto-pilot is groggy. However, the reality was made clear to me - very little of what I take pride in doing myself (especially transportation) is practical or even possible. The day I tried to return to my apartment and resume a normal life, I was forced to accept that little things like heading up/down my 34 stairs, taking a bath, or being vertical long enough to brush my teeth & wash my face - the most ridiculous of small challenges left me exhausted. Time had passed without my knowledge, challenges could be overcome but would take their toll, and I accepted that I would waste much of my energy on recovery if I did not start accepting help as it was offered. My main concerns from here on out have less to do with successful recovery and rehab than they do with the possible complications. Going from the most active person many of my friends knew to an all-but-sedentary bump on a bed has my mind on high-alert to any unusual sensation in my leg. The hard pooling of fluid in the pad of my foot - tingly to the touch. The throbbing calf pain. Whether I should rest my cast/splint on the inside, outside, or squarely on the back. I wonder if I would feel all of this if I were on the dulling medications; I wonder if masking these pains is dangerous or par for the course. Even with the challenges & occasional overconfidence, I am still getting stronger & healthier daily. I’m off the prescription pain killers & trying to take very little of even the OTC ibuprofen I’m allowed. It’s probably a good thing I’m staying with families that refuse to let me do anything for myself (trust me, I’ve asked numerous times) because I can stay awake for most of the day and have energy to spare. As one who values her independence ad ridiculum, it could be frustrating to live on someone else’s schedule. For a few minutes every day, it still is. I take pride in my physical toughness and my mental tenacity, so now I need to back it up with intentionality of action. By that I mean I’m going to use this learning opportunity to refine my time-management skills. One more thing. I’ll make sure my needs are met - even my need for independence. I am so glad with this information because this is so useful. I just apply all the steps you shared and get to know all the answer is right for restore windows 10 OS computer. Thank you! If you are a fan of messaging innovation, you should have come across snapchat online login. Snapchat online is a prominent messaging solution. So how was the drive? The return to FWB is the BEST! That is how I started. First a quick shuffle from the bathroom to the hall closet to grab something I’d forgotten. Then a shuffle from the bedroom to the bathroom. Then a shuffle to the livingroom where my husband shook his head and said, “I hope you know what you’re doing!” - Apparently, I did. hey there, ouch! are you still in your cast? Hi fuegaliciuos! Sounds like me–six days after my surgery when my right crutch went flying away from me (due to a wet spot in the kitchen). I was able to grab the counter on my right but not before putting too much weight on the right. My first thoughts were, “I’m screwed!”. The pain was crazy, but thankfully not as bad as I imagined. Like normofthenorth recommends, hold back and just push a little bit each day! Gradually, those muscles and your Achilles tendon will remember what to do, and you will rejoice at your progress when it comes time to go FWB! The word you should repeat like a Mantra is INCREMENTAL! Keep progressing, but don’t lose attention (or your mind! ), and don’t do a LOT more than you did already. And keep an eye on a good proven protocol, too, like bit.ly/UWOProtocol , to make sure you’re not getting too far away (ahead OR behind) a good proven schedule. This was the greatest part of my recovery. My daughter and her boyfriend would take me to the store on a Saturday night to go shopping. Best time to go, or Sunday night is also great. The grocery store I like to go to is in an “elderly” part of town. I fit right in! What a sense of freedom! Hey, nice ride there! Looks like fun! You are giving me ideas about shopping! A bath is glorious! I didn’t take a bath until I got my splint/cast off. I had to shower with a trash bag wrapped around my leg and sitting on a shower stool. Used the good ole doggie sprayer - not fun but still effective. I don’t think I could have lived with myself with sponge baths and no hair washing. Keep posting - you make my day when you post. Wow, I’m impressed! I’m still trying to get rid of a callous on my hand from the crutches. You are hilarious! 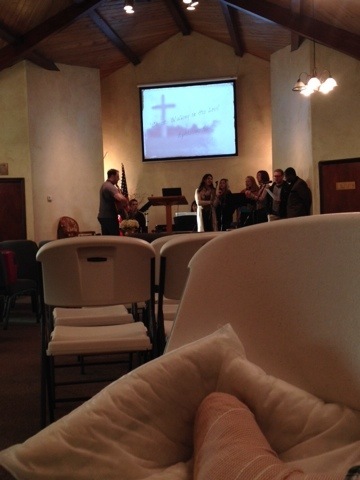 I went to a funeral service about 4 days after my surgery. My foot looked just like yours! It was kind of hanging out in the isle, but luckily, no one tripped on it. I used ibuprofen, usually only 200mg. A lot of studies discourage nsaids, but my OS had it in my list of options. I was healing very well, however. I did stuff on my crutches that made my family cringe with the possibilities of how I could further break myself. Just land in the good foot if you lose your balance! Janis, they did in fact do a nerve block on the one that runs along the outside of the lower leg & attaches to the top of the foot. I was so grateful for that block once it wore off & I realized how much pain I could have been in on that first day. The surgeon was saying that if that nerve reacted poorly to being moved, I could end up with a burning pain to the top of my foot for up to 3 weeks! I only had that burning sensation for a day or two. The most intense pain was probably near the incision site and the part of the tendon that was sutures together, but even that has calmed down & is more than tolerable with a single tablet of the oxycodone. The general soreness in the area, I’m sure I’ll learn to accept it as I phase out the prescriptions for some OTC NSAIDs in the next few days. Did you use aspirin at all for pain or mostly the ibuprofen? Did they do any blocks on your lower leg? That greatly reduced my pain and I only took pain meds for a couple days. After that, low dose Advil actually worked really well. Here’s hoping that’s under control soon. One of the things that scared me about this surgery was the potential for post op pain. 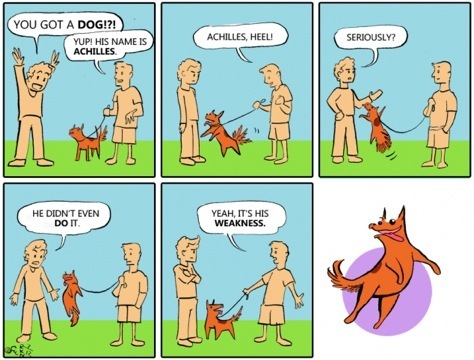 Hysterical! Good luck and I hope you can get off your meds soon. Yes, good luck! If you’re hobbling around in shoes, your calf muscles may still be tightening on some steps. In a boot (if you trust it) they shouldn’t. Thank you so much for the support & well-wishes, btdubs. Yeah, I wish I had a time machine! But I’d probably waste it on the 80s or something & forget I wanted to skip the visit to urgent care, go with my gut, & call orthopaedics & sports med the very day I returned from Alaska! Not that I’d have avoided surgery for sure, but walking in so much pain for so long as it got steadily worse should have made me a little pushier to get this diagnosed right proper. What a freak accident! Who knew? Tag! BTW, almost ALL of us THOUGHT we’d been clobbered on the back of the leg, but you really WERE! Very unusual! I’m the leader of the non-op Glee Club here, but I’m with Ryan. All the successful non-op studies treated only fresh ATRs (<14 days), so you’d be navigating uncharted waters, not evidence-based. I’d get the op. Non-op is often a viable route, but it is most successful when the injury is identified quickly, and the ankle is immobilized in plantar flexion as soon as possible. You’ve been walking on the injury for so long now that I fear surgery might be required to initiate proper healing. Good luck! Good luck - I hope you have your results now and have a plan for recovery. To echo the comment above, whether you end up with surgery or non-op treatment you will find this site really helpful. I am happy for you that you found this site before you had your surgery or your recovery as some people don’t go the surgery route. The people here re great and will be a wealth of knowledge and support! Chronicles of a Cheerful Gimper is proudly powered by WordPress and WPDesigner..